Both of the works featured here were patterned after A Ceremony of Carols, Benjamin Britten’s masterpiece for harp and treble voices. They closely follow Britten in instrumentation, scope, and the use of Middle-English texts from the 15th and 16th centuries. Where Britten’s melodies are primarily original compositions, John Rutter chooses in his Dancing Day to use the original melodic material and breathe new life into them with his considerable skill at harmony and counterpoint. In addition, he inserts two breathtaking movements for the harp alone that are fantasies on the carols that follow. In his Procession & Carols, James Bingham follows Britten’s lead in composing original melodies, the exception being the opening song Qui creavit celum (also known as the Chester Carol, it is regarded as the first carol written in England). His musical language is more rich and complex than Rutter’s, full of sevenths, ninths, and other dissonances that, though challenging, nevertheless remain beautiful. There is something very special about the combination of harp and treble voices. The delicate nature of the harp perfectly complements the ethereal quality of the voices, and the whole is nothing less than divine. 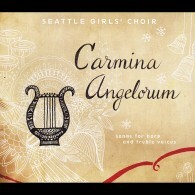 I hope you enjoy these carmina angelorum (songs of angels).